Popular author, retreat leader, and priest Barbara Crafton rises early each morning, lights a candle, opens her Book of Common Prayer, and reads the morning officethe ancient Christian service that praises God at the beginning of a new day. When she is done, Crafton sits down at her computer and sends out an e-mail that says simply, "Let us bless the Lord," the traditional closing line of the morning prayer service. Her devoted readers reply, "Thanks be to God. Crafton communicates with thousands of subscribers to her daily e-mail meditations. Theyand others who say the Daily Officeswill treasure this collection of brief meditations. Based on the assigned biblical texts for each day of Year Two from Advent through Holy Week, Craftons writings complement perfectly the morning, noon, evening, and nighttime prayers that are the Daily Offices. 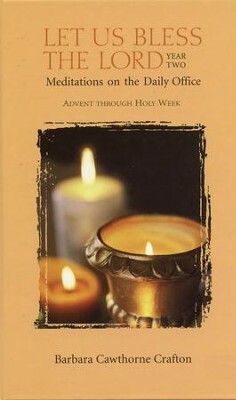 I'm the author/artist and I want to review Let Us Bless the Lord, Year Two: Advent through Holy Week: Meditations on the Daily Office - eBook.